Dear Publishers: It’s called a “slipcase”. I’m thrilled to death that publishers are getting behind fancy private library editions; big, beautiful hardcover tomes for display or general celebration of bookness. We’ve had a particularly meaty month at my bookstores – doorstoppers are coming fast and furious. Northwestern University Press has published an all-in-one edition of Dante’s Divine Comedy, translated by the ubiquitous Burton Raffel. Yale’s Autobiography of Mark Twain – volume ONE of THREE – weighs in at about 700 pages. We continue to sell out of copies of Joseph Frank’s 1000-page abridged (from 2500 pages) edition of Dostoevsky: A Writer in His Time. I love big books, I do. I have a probably unhealthy attraction to works that exceed 500 pages; the more the merrier. But if I may – as a bookseller and a collector – make a suggestion? These books look lovely sitting flat on a table, but as time passes they inevitably make their way to shelves where they must stand upright, or into paperback editions where they are nearly as thick as they are tall. They puff-up, tilt and sag. The Pevear and Volokhonsky War and Peace published by Knopf published in 2007 is probably a case in point – in paperback, the book inevitably looks old and used after a mere two weeks on the shelf. It is too big. The binding – especially in paperback – can’t hold shape with so many pages. This is an easily remedied problem. It’s called a slipcase. You’ve seen them before, a nice cardboard sleeve that hugs two or more volumes together in one tight box. 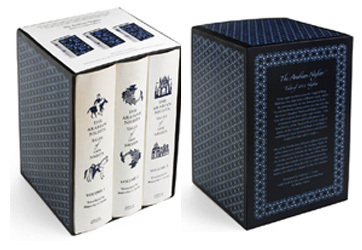 Penguin released a beautiful trade version of The Arabian Nights translated by Lyons & Irwin in 2008 which housed three hardcovers in one slipcase. See how manageable each volume is? No slipping, sliding or flip-flopping around. No puffy, humidity-soaked pages or disintegrating “perfect” binding. And one wide canvas for all your design needs! You can have your cake and eat it too: all-in-one editions without asking one binding to hold all those pages in one. And wouldn’t it be nice? A 3-volume slipcased edition of Vikram Seth’s A Suitable Boy? Davies’ Deptford Trilogy? Penguin, please, bloody Clarissa? We will all thank you for it. Last year I posted in some depth on the subject of academic ebooks – a different subject entirely from frontlist/trade ebooks, let me state right up front. We’ve had some difficulty selling digital books, and I thought I’d update for 2010, with a view on providing some data to academic ebook publishers. IT ISN’T WORKING. Whatever you are doing, stop. This year, like last, digital “codes” for textbooks was a COMPLETE BUST. Of one title, we have sold to date 750 traditional textbooks (which include the code for the digital book), and 2 copies of the “code-only”. The response at the cash is overwhelming – absolutely nobody wants to pay $55 for “nothing” – a piece of paper that gives them access to information for 12 months. They are willing to pay extra to “get something”. Similarly, we thought we’d experiment this year with shorting orders of books which could be found online for free (the texts of which can be found at Project Gutenberg or similar). Students want free books, right? They love technology? Once again, the response was overwhelming in favour of “real” books. Paper books of open-source texts are so cheap anyway that students will pay the $3-$11 to get that “something”. About the texts online we hear you “can’t make notes”, “I don’t like all that scrolling”, “At least I get to keep it this way”, etc. The ephemeral nature of an ebook is not lost on these kids. There is a value to permanence. Now, there are things that could be done to encourage the sale of the digital book. The paper books could be sold *without* the digital codes thrown in for free. Given the ultimatum, more students might go for the digital book over the paper one. Make the digital texts better suited to printing – that might help too. But I ask myself, why? Why are we doing this? Audience reception is part of what has always made me uneasy about ebooks. Aren’t we putting the cart before the horse? Was there some great need for a new way to read texts, thus came the ebook? Were readers clamouring for this technology? No, technologists came up with something new and they’re trying damn hard to sell it. Publishers are a wreck, bookstores are panicking and readers are grudgingly trying to find a way to like the technology. The only people who are happy are the technology manufacturers. But another year, another step closer to the supposed internet generation. Maybe next year will be the big year for digital delivery of textbooks. Or maybe it won’t. Maybe now that the shine has worn off, we can start having a serious discussion about what constitutes value added. Right now the product we see looks like ill-considered trash to be thrown out with the cellophane wrapper. Or maybe if the technology manufacturers are so keen on a Kindle in Every Backpack, they’ll start bundling those for free with the texts. Just a thought. ETA: Apparently I’m not alone!